PNNL is currently developing a novel testing capability for studying dynamic mechanical behavior of materials in a high-pressure hydrogen environment. The testing apparatus will consist of a modified DMA drive system mounted within a hydrogen autoclave, and outfitted with a sub-ambient temperature regulation system. Equipment power, coolant, etc., will be supplied via feedthrough ports on the autoclave. This will allow for the measurement of complex deformation and expansion during pressure cycles up to 5000 psi and temperatures from ambient to -50 °C. 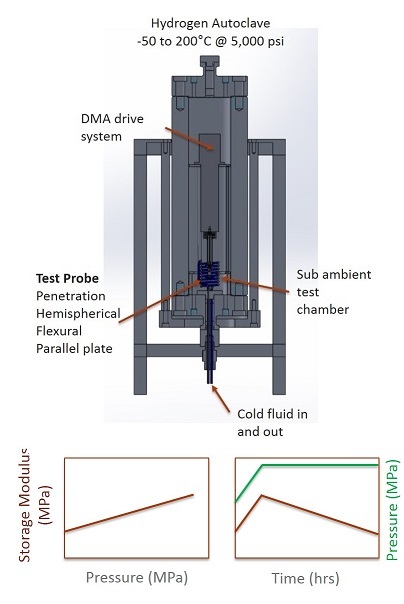 The drive system itself is a direct linear actuation type, capable of applying cyclic loads perpendicular to the specimen stage at frequencies ranging from 0.01 to 20 Hz and with mN scale and submicron position sensitivity. The actuating element can be fitted with various test geometry configurations (such as a hemispherical probe, parallel plate, extension, and 3- or 4-point bend).